I was lucky enough to receive a copy of this book from Louise herself and when I looked back at the date she sent it to me I realised it was November last year. I’m sorry it took me so long to read it and I’m now reviewing it on publication day by the skin of my teeth! Tina Thornton’s twin sister Meg died in a childhood accident, but for almost forty years Tina has secretly blamed herself for her sister’s death. During a visit to her aging Uncle Edward and his sister Lucia, who both harbour dark secrets of their own, Tina makes a discovery that forces her to finally question her memories of the day her sister died. Who, if anyone, did kill Meg? As Tina finds the courage to face the past, she unravels the tangled family mysteries of her estranged parents, her beautiful French Aunt Simone, the fading, compassionate Uncle Edward, and above all, the cold, bitter Aunt Lucia, whose spectral presence casts a long shadow over them all. A Life Between Us is a beautifully evocative story of a family torn apart at the seams, which will appeal to readers who enjoy family sagas and modern-day mysteries. 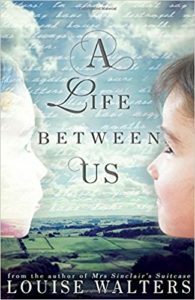 A Life Between Us is the story of how losing her twin has affected the whole of Tina’s life and about how secrets within families can eat you up. We have two time frames: one is 2014 in which Tina and her husband, Keaton (by the way, what a fab name!) are going about their everyday life. Tina has never been able to come to terms with Meg’s death at the age of eight. Keaton loves Tina dearly but temptation is coming his way and Tina’s strange behaviour is pushing him closer towards it. And we also have the sections in the past: mean Lucia’s story and then the long, hot summer of 1976, that summer when Tina and Meg are eight and we know disaster is coming. Louise Walters has a really charming writing style. She deals with key issues of grief, loss and disappointment so well. In the interview at the back of the book she talks about trying to put a twist into her writing but finding that that is not something she excels at. And isn’t that refreshing at the moment? A straight up and down story with no big reveals, just a really well put together narrative where events unfold as we read them. There are characters to really care about in this book. I really took to Keaton and Edward in particular, and I did also like Tina and her friend, Kath. Lucia was the villain of the piece and her dissatisfaction with life and everything in it was palpable. She was a character I loved to hate! I’d previously read Louise Walters’ first book, Mrs Sinclair’s Suitcase, which I enjoyed, but I enjoyed A Life Between Us more. It’s a brave foray into self-publishing for the author which I believe will pay off. It’s an excellent read. I love to read about families and how they interact with each other and deal with life’s trials and tribulations and this is the perfect book to showcase that. The different time frames work well as a vehicle for revealing the story and it all came together beautifully at the end. I loved it! With thanks to the author for the review copy. A Life Between Us is published today in paperback and ebook. 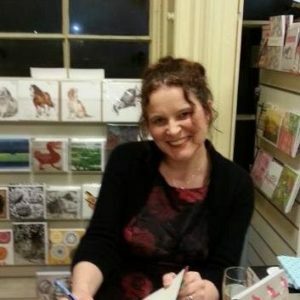 Or even better you can buy it directly from Louise’s Etsy shop and get a signed copy and a bookmark too. Louise Walters lives in Northamptonshire with her husband and five children. Louise’s debut novel, Mrs Sinclair’s Suitcase (Hodder, 2014), was translated into 15 languages. A Life Between Us is her second novel.